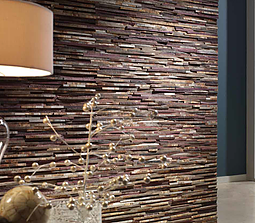 Nature Collection Wall Panels are made of different textures taken from nature which mimic natural elements. 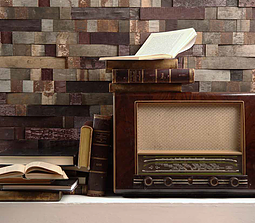 Nature panels are made of recycled wood barrels of Rioja wine and sherry, which will definitely add to your rooms a natural environment. 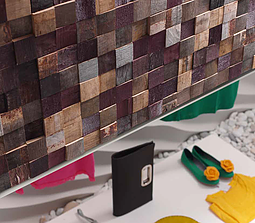 Wood also allows to play with both shapes and colours in the room. Nature collection comes in three different designs, Cabernet, with thin elongated forms, and Merlot and Pinot with geometrical shapes. In terms of colours, these panels combine randomly a mixture of colours, from brown to different reds and purples, dark grey, black and white. All those create a balanced contrast that will provide a sense of liveliness, dynamism and balance to the room. Therefore these panels can be combined with a range of natural colours and decorations that add joy and comfort to your personal space allowing you to reflect your own personality in a simple and natural way.